Form 592-B or the "Resident And Nonresident Withholding Tax Statement" is a form issued by the California Franchise Tax Board. 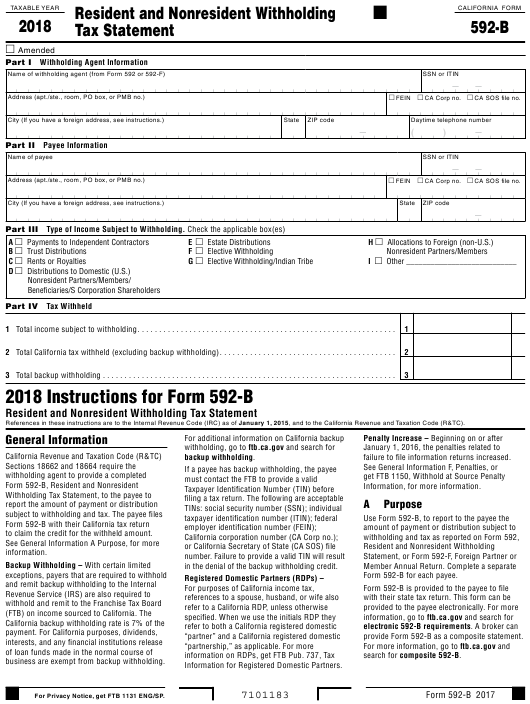 Download a PDF version of the latest Form 592-B down below or find it on the California Franchise Tax Board Forms website. 1 Total income subject to withholding. . . . . . . . . . . . . . . . . . . . . . . . . . . . . . . . . . . . . . . . . . . . . . . . . . . . . . . . . . . .
2 Total California tax withheld (excluding backup withholding). . . . . . . . . . . . . . . . . . . . . . . . . . . . . . . . . . . . . . . . .
3 Total backup withholding . . . . . . . . . . . . . . . . . . . . . . . . . . . . . . . . . . . . . . . . . . . . . . . . . . . . . . . . . . . . . . . . . . . .
References in these instructions are to the Internal Revenue Code (IRC) as of January 1, 2015, and to the California Revenue and Taxation Code (R&TC). failure to file information returns increased. to claim the credit for the withheld amount. in the denial of the backup withholding credit. Form 592-B for each payee. provide Form 592-B as a composite statement. business are exempt from backup withholding. Information for Registered Domestic Partners. For Privacy Notice, get FTB 1131 ENG/SP. installment payment is made. See Treas. Regs. Enter the payee's name, TIN, and address. accompanying the distribution or payment. grantor’s individual name and SSN or ITIN. to foreign (non U.S.) partners or members. • Complete all applicable fields. federal application to the back of Form 592-B. to submit the assigned FEIN. payments to residents or nonresidents. payee by the due date. must provide it to the FTB upon request. Enter the total income subject to withholding. calendar year for residents or nonresidents. Internal Revenue Code (IRC) Section 6045.
financial institutions, and 12.3% for all others. which the withholding took place. members in the LLC are foreign. December 31, 2017, use the 2017 Form 592-B. tax that they must otherwise pay to the IRS. the requirement to file a California tax return. numbers, see the information below. • You do not file a California tax return. • You file your tax return late. Form 592-B to the payee. to determine your California source income. to the FTB upon request.